Whether you make your own nursery rugs or buy an area rug ready-made, choosing the right size, color and theme is an important part of decorating your baby's first room. Nursery area rugs not only make the space cozy and inviting, but they give the baby boy or girl's décor a finished appearance. Nursery area rugs come in all shapes, styles and in every color of the rainbow as well as in the top themes and color schemes. New mothers love pink area rugs with patterns of bunnies, flowers and/or bows for a baby girl's nursery and baby blue nursery area rugs with puppies, horses,airplanes or other masculine designs for their baby boy's room. Compare a hard, bare floor to one covered with a soft nursery area rug and you will quickly see the decorative impact that the right rug can have on both the looks and on the comfort level of the baby's room. The floor as well as the walls are an excellent opportunity to design and decorate that should not be overlooked. Nursery area rugs are more stylish than ever before not only because they provide baby with a soft place to play, but because make such a contribution to the design of the space. If you have chosen a theme or a color scheme, you're ready to shop for an area rug. You will find them in most of the top baby themes and colors reflected in new crib sets seen in the stores at any given time. Many styles are unisex or gender neutral such as the ABC rugs, jungle rugs, dogs or cartoon characters that will work for both baby boys and girls if you would rather avoid baby blue or pink rugs that are very gender specific. Shag rugs or braided area rugs are lovely but difficult to clean so they may not be the best option for a kid's bedroom. If your baby suffers with allergies, wool area rugs (unless your baby is also allergic to wool), manufactured without irritating chemicals or dyes might be an option. Check to see if the rug has had stain protection or mothproofing applied. Wool is naturally flame retardant so there would be no need to apply a flame retardant to the fibers. If you are concerned with air quality in your home, but enjoy the comfort of carpet a wool rug may be for you. The only drawback with non-allergenic wool area rugs would be that they are not very colorful. 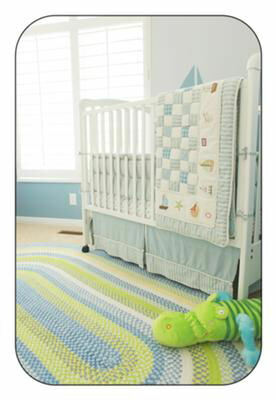 Nylon area rugs are another option for the nursery as well as the kitchen because they are strong and stain resistant. However, keep the pile low because a shaggy round area rug might be cute the first day or so, but after that the maintenance that it takes to keep it looking fresh might outweigh the fashionable look.